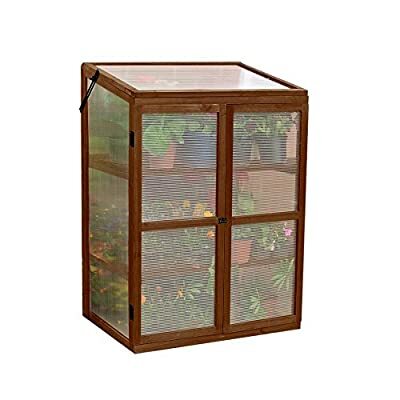 Gardman 7652 Wooden Cold Frame and Growhouse. Use as a permanent Growhouse and extend the growing season by insulating plants from frost. Perfect early spring protection while you "harden-off" young plants before placing in your garden. Solid jointed wood frame constructed of FSC certified timber. Body and doors are constructed of tough, twin-walled polycarbonate to allow in sunlight and provide insulation. Features two slatted wooden shelves, double doors, and hinged easy access door on top. Simple, adjustable height locking mechanism allows door to remain open for all-important ventilation. Dimensions: 22" Long x 30" Wide x 43" High. Gardman "Bring your garden to life"